SHIGATSE, Tibet, However hard China tries to deny it, there remains a suppressed yearning across the roof of the world for the return of the Dalai Lama. China has been seeking for decades to consign Tibet's spiritual leader to irrelevance. But last month, two senior Tibetan envoys from the government-in-exile arrived in Lhasa for a visit that could mark the first step toward his return. It may mark the restart of a dialogue broken off in 1993. "It's encouraging, even though we don't know what the next step will be," said Tsering Tashi, exiled Tibet's representative in London. "It's been quite some time since there's been any official contact." A quirk of timing provided the opportunity to make a solo trip across normally closed regions of Tibet to join a government-sponsored delegation to Shigatse, the second-biggest city, and Lhasa, the capital. In streets of mud-brick homes in the countryside, it is startling to be accosted by people surprised at the arrival of a Westerner in a country renowned for its isolation. The package tour hit Tibet 20 years ago, but villagers outside the cities are still awestruck to glimpse a foreign face. At a teahouse that serves salty Tibetan tea and yak-butter snacks, a foreign presence is less sensational, but the desire to see the forbidden face of the exiled spiritual leader, who fled fearing for his life in 1959, is just as great. An old man with thick homemade glasses that magnified wrinkles seared into the skin by exposure to the sun at more than two miles above sea level grabs a guidebook and flicks back and forth until he finds a drawing of the Dalai Lama. But even here the Chinese have their agents. 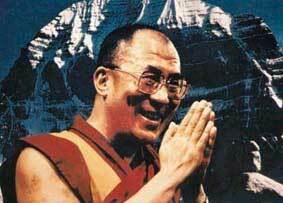 A young man approaches the door of the teahouse and asks in English for a picture of the Dalai Lama. He has been to Dharamsala, the Indian seat of the Dalai Lama and the Tibetan government-in-exile, he says, but he seems somehow too interested. Moments later, the suspicion that he is a spy appears to be confirmed when he walks back to join a Chinese man standing in shadows across the street. Tibetan officials and monks in Shigatse, closely watched by their Chinese superiors, maintain that there is no hankering for the return of a man castigated as the figurehead for an evil, feudal theocracy that enslaved its people. "We only have regard for all patriotic Tibetans who belong to one country and love one country as one family," said Raidi, the most senior Tibetan woman in the Shigatse government. In the brilliant daylight, the gold statues of the Tashilumpo monastery, base of the second-most powerful religious figure, the Panchen Lama, gleam against the backdrop of a soaring mountain face. But the cobbled streets snaking through the vast monastery, the home of 800 monks and a traditional place of worship, are eerily empty. When monks do appear, they hurry by. Monks at Tashilumpo, a key battleground in Beijing's quest to control Tibetan Buddhism, are given "patriotic lessons" twice a week, according to Neldradrak, the monk who heads its Democratic Management Committee. Though spared the wave of destruction that destroyed more than half of Tibet's monasteries in the Cultural Revolution, it is riven by the conflicting loyalties resulting from Beijing's imposition of its own Panchen Lama. Chinese and Tibetan officials say Beijing is pouring billions of dollars into Tibet to lift it out of the grinding poverty that blights other remote and sparsely populated countries. China's officials argue that the alternative to its program of massive inward investment is wasteful, African-style aid. "A golden era of self-sustainable development has taken place since the collapse of the old feudal system of serfdom," said Yu Yongjin, deputy director of Shigatse prefecture. Commercial trappings are emerging among Tibetans. Many have set up roadside stalls selling drinks and gasoline to motorists and the traditional woollen tunic, the tuba, is being replaced by clothes made in China's textile mills. Evidence that Chinese migrants are largely monopolizing the economic opportunities arising from Beijing's spending spree is widespread, from the road gangs that mend the Lhasa road, to the cities where Chinese faces predominate. The government rejects suggestions that it is swamping Tibet with Han Chinese and claims that 95 percent of the region's population is still Tibetan. In a rare moment of candor that let pretense slipped, Mrs. Raidi, the senior Tibetan woman in the local government, conceded that, although Shigatse's registered population is 40,000 scattered across a region the size of Britain, the actual total is 90,000 if the migrant population in the towns is counted. The contradictions in the government line is evident in the government's own statistics, which showed that Tibet's economy grew by 13 percent last year, but average incomes for Tibetans stayed stagnant.